The Palermo district is the top choice for most tourists when it comes to accommodation. Peter and I got a studio apartment through Airbnb in the Palermo district and we couldn’t have been happier with it. Amazingly, despite it being a rather large apartment with its own kitchen in a nice neighborhood, we only paid a little over $40 USD per night. What sets Palermo apart is the vast number of parks and attractions. In this district, there’s a free botanical garden filled with some of the most interesting statues I’ve ever seen. Kiddy corner to this garden, you can find the local zoo. We didn’t go inside, so I can’t speak to its quality, but it’s large from the outside. Across the road is a racetrack for horses. Just a bit further, you’ll find a vast rose garden (which we saw from the outside but didn’t have time to actually explore). The garden looks nice in the winter, but I’m sure it’s especially beautiful when it’s blooming in the summer. Across the road from the rose garden, we found the park where all the dogs play. 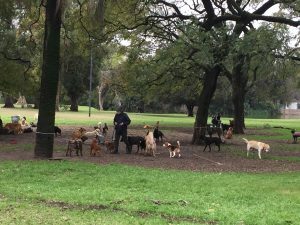 If you’ve read our post on the cat park in Lima, we found the equivalent dog park in Buenos Aires! That’s something worth noting: there are dogs everywhere in this city. During the day, many people hire dog walkers who take 5-10 dogs at a time on walks around these parks. When they aren’t walking the dogs, they have them tethered in one area of the park to keep an eye on them. Beware of the poop though! It’s everywhere in this city- parks and sidewalks alike. Next to this informal dog park, you can tour a Japanese Garden, which honestly wasn’t as large or elaborate as I’d hoped, but worth checking out if you like. 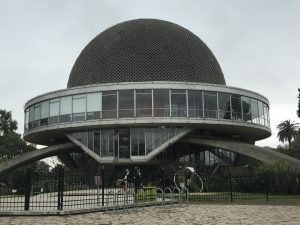 Across the road, you’ll find the planetarium, which looks like it was built in the 70s and could benefit from some remodeling, but it’s still cool regardless. Make sure to check out the inside because they have several interactive exhibits on space and the Earth. Everything is in Spanish, but it’s still fun to play around with the 3D planets nonetheless. 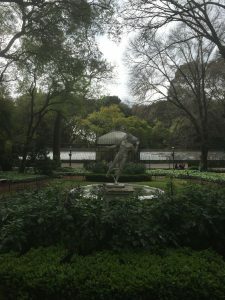 Aside from these parks, there is one other area that’s worth checking out in this district: Palermo Soho. Peter and I stumbled across this sub-district of Palermo only a few blocks away from our apartment. It was filled with colorful restaurants, quaint cafes, and chic shops. Everyone in this area seemed young and fashionable. Peter and I spent several hours zigzagging through these hopping streets, enticed to go down every road we passed. If you’re looking for multicultural food, this is the place to find it. Puerto Madero originally didn’t interest me much. It was low on my list of districts to see. Yet by the end of the trip, we had purposely visited this area three times in the span of three days. If you like the look of the modern city with the glass skyscraper buildings, Puerto Madero is the place for you. It was originally built as the new port for Buenos Aires, but when the water got too low, the ships couldn’t get in, so they moved the port and now it’s mostly just for show. When we visited this district, we got to explore the ARA Presidente Sarmiento, which is a navy training ship that has been converted into a museum, recounting its 6+ voyages around the world from 1897-1961. 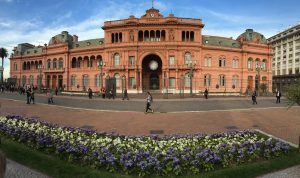 The other attraction that kept bringing us back to Puerto Madero was the vast ecological reserve: an 865-acre park that is free to the public. We tried to visit this reserve on three separate occasions, but every time it was closed due to rain or the day of the week (It’s closed Mondays). When we return to this city, it will be at the top of my list. After Palermo, Recoleta may be my second favorite district. It’s the wealthiest district in Buenos Aires, so you would often see flashy dressers or women in fur coats strutting the streets. The most notable attraction in Recoleta however, isn’t the living, but the deceased. 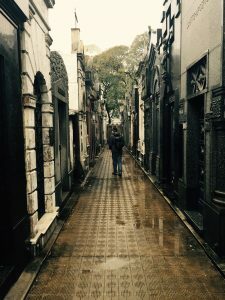 I know that sounds morbid, but the Recoleta cemetery is something you don’t want to miss. This is where all the wealthiest families of Buenos Aires are laid to rest, and they went out in style. This vast cemetery is filled with elaborate stone tombs, decorated with sculptures of angels, Jesus, or the deceased themselves. Many of their coffins are plated with fine metals and intricate designs. I don’t know what is most disconcerting- the excess these people spent on themselves after their deaths in order to be remembered for centuries, or the shocking disrepair many of these tombs have fallen into. Despite the exorbitant costs of these tombs, many of them have broken doors, garbage and cleaning supplies inside, and even some of the coffins have been broken. The weather wasn’t good the day we visited, so we didn’t get to take a tour and learn about all these famous, wealthy people, but I’m sure you would get more out of the entire Recoleta district, if you showed up for another one of the free walking tours, either through the city tourist office or buenosairesfreewalks.com. 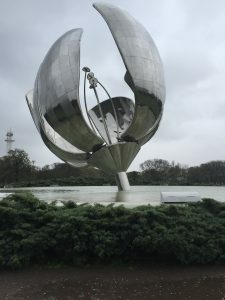 Another must-see attraction in Recoleta is the steel and aluminum flower sculpture called Floralis Generica. It was built to open its petals in the morning and close them in the evening and it weighs 18 tons! On a sunny day, it would be especially beautiful to see. The best way to see the city center is through a free (tip based) walking tour. They can fill you in on all the fascinating politics and history that has made their country what it is today, as well as explain each government building or piece of art. Peter and I went with buenosairesfreewalks.com, which lived up to its high recommendations. 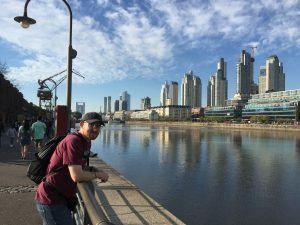 We didn’t spend a lot of time exploring San Telmo, although we had a hostel there for four days (Peter was bedridden most of that time due to our previous Peru adventures). 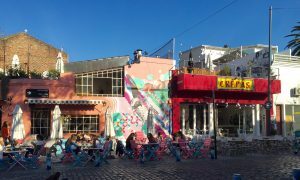 We read in multiple places that San Telmo isn’t the safest district after dark, and it seemed to have more trash and graffiti than some of these other districts, but it is a popular area for hostels nonetheless. For me, the biggest attraction in San Telmo is the San Telmo Market. 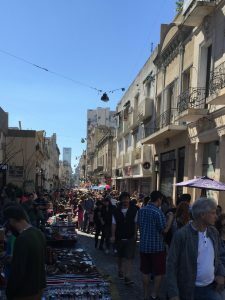 Every Sunday, they fill one street with vendors selling antiques and an array of tourist goods that stretches for miles. We never did see the end of it, even though we explored the street for at least a few hours. 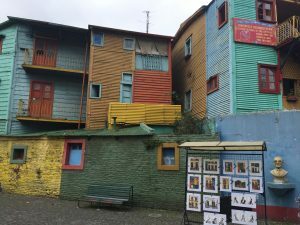 When you google “Buenos Aires,” pictures of La Boca are often some of the first you see. They show tango dancers in front of colorful buildings on cobble stone streets. However, in reality, this district was quite underwhelming for us. It is a dangerous district and not recommended to visit without a guide. 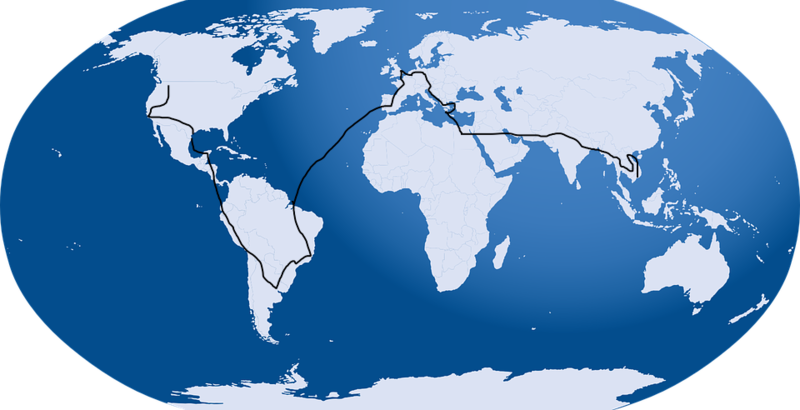 (You could check it out for yourself, but you need to stay in the touristy area and be aware of your surroundings.) Regardless of the potential dangers, I was really looking forward to this district. I was disappointed to discover the touristy area was much smaller than I expected- only about three blocks- and the colorful buildings weren’t nearly as vibrant as they appeared in the saturated pictures. However, we visited on a very cold, windy day so there wasn’t a whole lot of action. The tour guide said if it’s sunny or a weekend, the streets are packed, so don’t write it off just on our account. Regardless of your interests, Buenos Aires has something for you. The real appeal of this city is the variety. With so many unique districts, there is something for every personality. If you’re like me and you travel for the art and the parks, you will have weeks of exploring to do. If you’re a foodie, Buenos Aires will meet all your expectations with amazing steak, wine, ice cream, and international cuisine. 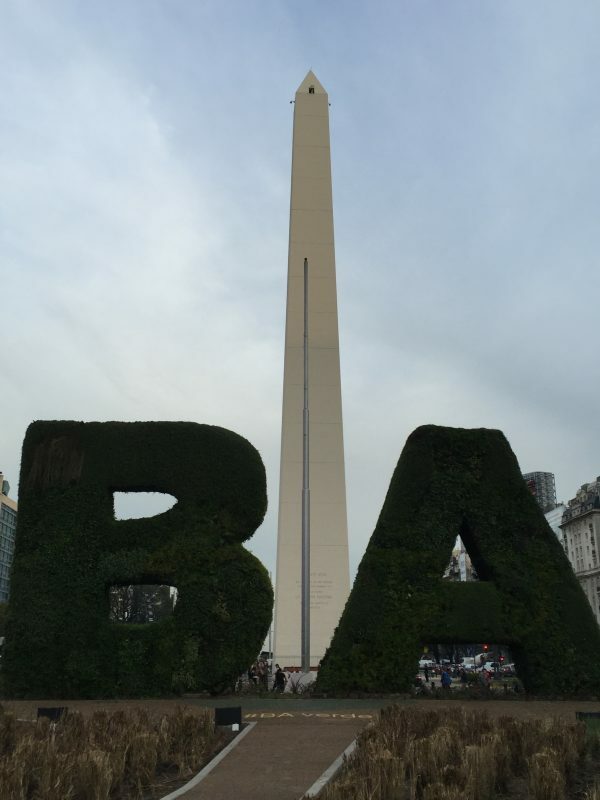 Flying all the way to South America is worth it just to see this fascinating city!